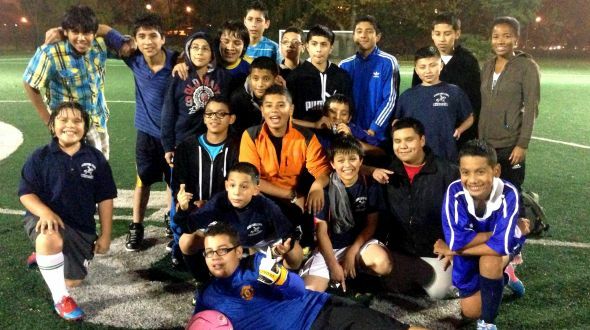 This Fall, Nobel school participated in the CPS soccer league for the first time ever, and had such success that they will be competing in the city-wide finals this weekend. Nobel has never had a soccer team for the middle school before, but the demand is very high, so when Coach Veronica became the REC Coordinator there this fall, she decided to lead the team. Team Nobel was undefeated in their regular season, and won a tight game against Cameron Elementary to advance to the city-wide finals. Several of the players participated in the Work to Play program when they were younger, and some still particiapte as Team Captains. Urban Initiatives is SO PROUD of Coach Veronica and Team Nobel!